Sign in to the website for your financial institution. Use the bill payment option and select Family Maintenance Enforcement Program as the bill payee, see note. Enter your personalized account number. Enter the amount to be paid. Select the automatic recurring payment option. This is a combination of the FMEP case number and the first 4 letters of the payor’s last name, for example, Joe Smith’s number would be 1234SMIT. This number can also be used to send payments by telephone or ABM banking. The bill payee name for FMEP may vary among financial institutions, i.e. 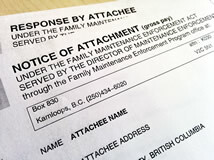 “Family Maintenance Enf (BC)”, “FMEP – BC”, or “Family Maintenance Enforcement Program – BC”. Sending payments for a NOA?